I know it was a week or two ago, but I am still – somewhat perversely – amused by Donald Trump’s ‘mis-speaking’ in a press conference with Vladimir Putin in Moscow. Do you remember it. He missed the word ‘not’ off. Easily done, obviously. The funny thing is that as soon as you hear the … er … wrong statement, it makes your mind search for the real thing. I remember speaking at a dinner for charitable financiers in London and concluding with the words of Jesus: “It is easier to put a needle through your eye than for a rich man to pass a camel.” Silence was followed by laughter as the mental cogs turned in search of what Jesus had actually said. Or, do you remember Jeremy Thorpe’s famous judgement on Harold Macmillan’s so-called ‘Night of the Long Knives” when he sacked loads of ministers in order to stay in power: “Greater love has no man than this, that he lay down his friends for his life”? Or Monty Python’s ‘Life of Brian’ where the people at the back of the crowd at the Sermon on the Mount think Jesus said: “Blessed are the cheesemakers”? I love it. Being so familiar with the real thing means we sometimes don’t listen and catch the power of the words or the idea any more. We just hear “blah blah blah”. It’s a bit like drawing. My wife is an artist and she once tried to get me to draw a chair. I drew it … and it looked terrible. When I showed it to her she told me to go away and this time draw the spaces around the chair. I did it – still badly – but the chair emerged from the spaces and I got the point. The point here, of course, is that we become surprised and curious when we see and hear things differently. So, if Jesus didn’t bless the cheesemakers, who did he bless? Isn’t the startling truth that love is seen in the sacrifice of my life for my friends? I think misspeaking can, if handled right, shine a light on something even more powerful and true. Anyway, didn’t Jesus also say: “Let your yea be nay, and your nay be yea?” Didn’t he? He is risen! So what? Language matters. Describing the latest military attack on Afghanistan as the ‘mother of all bombs’ is shocking in its ‘boys’ toys’ trivialisation – or glorification of extreme violence. And it does not bode well at a time when nuclear war seems more likely than at any time since the end of the Cold War – especially given the unpredictability of the President of the United States and his predilection for changing his mind quickly and inconsistently. To say nothing about the Great Leader of North Korea. An unusual way to begin a sermon for Easter Day? Maybe. But, this is the world we now live in at Easter 2017, and Christian worship cannot be an escape from it. But, rather than dropping high explosives onto other human beings, Easter explodes something different and more challenging into the world we know: Easter drops into the dark violence of the modern, sophisticated, scientific age the subversive light of resurrection. And that is what we are here for this morning. We do not simply memorialise an event that happened two thousand years ago somewhere far, far away. We do not merely cross our fingers and wish for a deus ex machina to intrude into the insurmountable problems of human living and sort it all out. Nor do we rush with relief to resurrection before we have properly looked the cruelty of Friday and the horrifying emptiness of Saturday in the eye and lived with our mortality. No, we are here this morning to have our lives transformed by an encounter with the risen Christ; anything less and we have missed the point. You see, there is a difference between looking and seeing. And sometimes we see, but don’t understand. And sometimes we don’t understand, so we turn away and look somewhere else for we know not what. So, consider the first evangelists: Mary Magdalene, Peter and the other disciple. Mary, a woman – significant in itself – sees the disturbed grave, but doesn’t venture in. Instead, she goes and fetches the blokes. They come running – probably suspecting a criminal religious or political plot – and Peter goes first into the empty tomb, followed eventually by the other friend of Jesus. Mary waits outside, distraught. And none of them suspect resurrection. According to verse 8, the friend “believes”, but this can only refer to believing Mary’s story that the body is missing. Mary, herself, just looks in and is distressed. In other words, they look and they see, but what they see makes no sense. So, the men leave and go back to their homes. Back to their homes? Not even to their other friends to tell them the bad news? Not to the authorities to ask what they have done with the corpse? Not to the newspapers to report the scandal? No, they go back home – to the places where they know their place, where life is ‘normal’, where they have some control, where there are no surprises. Now, this is not a merely incidental detail of a far-fetched story. Had I been Jesus I might have said to Mary, “It’s me … I’m back again!” But, Jesus gives her some theology to be getting on with. And he will not let her hang on to him like some sort of shrine god. When we think we have grabbed hold of Jesus, we soon discover that he will not be contained or controlled – even by our most powerful need for comfort or resolution or healing from grief. He moves on … as we, too, must move on, taking responsibility for what we do with the – often unbidden and unwelcome – experiences we have had visited upon us. But, back to the point: what we are doing here this morning. Mary did not go back to church. She did not write a book about her self-fulfilment. She did not simply reflect on what some theologians call ‘the Christ event’; rather, she became an articulate witness. “I have seen the Lord.” And only having put her own credibility on the line did she then go on to tell the friends what the risen Jesus had said to her. And for us? We cannot simply come this morning to celebrate a notional event, to worship a good idea, or to maintain the edifice of a credible faith. We come together to encounter the risen Christ, and then to go out into the world in the light of this and tell the good news: that contrary to Hollywood, the news and the rumours of what is normal, death, violence and destruction do not have the final word. Christian faith is rooted in the fact that Jesus who was fully alive before being fully dead is dead no longer. Not that he sprung back to life like some sort of zombie, but that, as the Apostle Paul put it, God raised Christ from the dead. That is where Christian hope lies: that God raised a very dead Jesus of Nazareth and brought new life – life that still bears the wound marks of human suffering and doesn’t simply wipe out reality – to a very confused world. I just wonder how we respond to this story? Or, perhaps putting it a little more sharply: not to the story, but to the content that the story conveys? The reality of a surprising and world-shattering encounter with the risen Christ who shows us the face of a God who will not be defeated by the misery of pain and loss, but shines light where even eyes are closed and darkness is at least familiar. Where we look, but don’t immediately see; where we see, but don’t understand; where we are surprised and confounded, but still go away and become articulate witnesses of how the risen Christ transforms our living and our dying. Of course, this is only the beginning. Meeting the risen Jesus in the garden of death and decay becomes the impetus for challenging death and decay wherever we see or experience them. On Good Friday we were compelled to look death and destruction in the eye and not look away. No romanticism; no religious escapism; no convenient spiritual comfort; no relief from all that the world can throw at God and us. No. We were offered the gift of staring in the face our mortality and the immense power of death – living with the loss and the emptiness and the abandoned desolation of seeing our hopes and faith bleeding into the dirt of a rubbish tip outside the city walls – and finding our grief interrupted by the gentle, whispered sound of our name being voiced by the one whose all-too-real death was not the end. Today – Easter Day – we are being invited to meet this risen Christ and to take the good news of resurrection into a world dominated by too much bad news. To offer the refugee and asylum seeker the hope that there is a future to be lived and a new life to be enjoyed; to question the political priorities of leaders whose vision dehumanises or breaks people down; to challenge injustice and public practices that exalt the mighty and denigrate the meek. After all, the risen Jesus is the same Jesus who challenged the religious securities of Pharisees who were content to use excluded and abused people to make theological points in their petty little power games. The risen Jesus is the same Jesus who healed the wrong people on the wrong day and in the wrong way. (Read the gospels and you will see what I mean.) The risen Jesus is the same Jesus who taught his friends to pray that God’s kingdom will come on earth as it is in heaven, but then embarrasses the pray-er with the obligation to be the answer to his or her own prayer: “Forgive us our sins … as we forgive those who sin against us.” The risen Jesus is the same Jesus who exposes our insecurities and fears, offering freedom in the company of others and the healing that comes from mercy and love. Do you see the point? We can sing our hymns and pray our prayers this morning and leave as we arrived – perhaps warmed by the experience, but indifferent to the need for commitment and a clear willingness to belong to this risen Jesus who sends us out – like Mary Magdalene – not with a solution to a problem or a heart-warming spiritual experience, but with a compulsion to tell the story of redemption and hope, and to work out in the company of friends what all this stuff means for us and the world in a world that now looks very different. It is this experience that led Paul the Apostle to write to beleaguered Christians facing imperial threat that “for me to live is Christ, to die is gain”. What we are doing here this morning is nothing less than the stuff of life and death, of living and dying. The worst we can do is to be indifferent to it. Later in this service we will be invited to come forward to receive bread and wine – or to receive a blessing which is freely offered. Bread and wine are tangible and taste-able tokens of all I have spoken about just now – the body and blood of Christ who poured himself out that we might be free to live differently, confounding the depressing narratives of the world we inhabit and promising life out of death. Like Mary Magdalene, Peter and their friend, we come to a place of death and loss and bewilderment – and maybe even hopelessness – and we come with empty hands and opened eyes. We cannot grab or demand or hold onto what we receive. We simply receive what is given – what is gift – and we consume them. They become part of our body – the fullness of God’s promise in the flimsiness of a wafer and a sip of wine. We thank God for them, and for what they represent. But, we are then sent out into the world (in the power of the Spirit) to live and work to the praise and glory of the God who raised Christ from the dead. That’s the deal. So, I invite you to come with honest hearts and eyes wide open, not hiding behind a fear of being found out, or the pride of thinking that I can’t dot all the Is or cross all the Ts. Come with your fears about your living and your dying, about loss and love and pain and joy. Come with empty hands and a will to live life from today as a resurrection person amongst a community of resurrection people who have the same experience as you, but cannot escape the haunting claim of a God who loves you to death and beyond. Maybe – for some of you – today might be an Easter Day on which your own transformation might begin. Surely, this is good news. Surely, this can draw from us a Hallelujah of relief and praise – one that means that from this day forward we know ourselves to be a people no longer driven in a threatening and uncertain world by anxiety and fear, but drawn by hope in the God of resurrection who comes to us, where we are, speaks our name, and sends us from the place of death to live life. This is the mother of all hope – the mother of all mercies. Well, we’re one day into Lent and I’m already struggling. The next five weeks give us time for self-examination – not the same thing as selfish introspection – and I never find this comfortable. And it reminds me of a very long car journey (from Leicestershire to Linz in Austria) with my family nearly twenty years ago. What it proved, of course, is how easy it is to mishear or misunderstand what is really going on or what someone is actually trying to say. Just how long my son had mused on the masochistic nature of Star Trek I have no idea; but, it clearly coloured his take on sci-fi. This isn’t new, is it? A reading from the Bible yesterday complained that God’s people had got the wrong end of the stick. They were supposed to fast and pray in order to expose themselves to the real stuff deep within them and examine their common life; but, they had turned this spiritual discipline into a way of showing off how pious they were. And Isaiah the prophet asks: can’t you see the irony when you pray to God for the poor while trampling all over them? If the language of your worship contradicts the living of your life – or the shaping of your society – why aren’t you embarrassed? The point is that it is dead easy to spot the gaps between the talk and the walk of other people, and really hard to spot our own. It’s what Jesus pointed to when he suggested people should pay attention to the plank in their own eye rather than the speck of dust in someone else’s. Well, that’s easier said than done. But, while hoping that Scottie recovers from his self-generated beatings, I now have the next month or so to shine a light on my own gaps and see what – under the gaze of a merciful God – can be done about them. Guess whose birthday it is today? OK, yeah, Paris Hilton and swimmer Rebecca Adlington … and probably a few thousand people listening to the programme now – in which case, happy birthday to you. But, the one I am thinking about is Ed Sheeran. 26 today. How do I know? Well, someone told me he originally comes from Hebden Bridge in my patch of West Yorkshire, and I thought I’d check it out. They’re right … and I noticed that it’s his birthday today. So, open your ears: I’m going to pause for a thought (which means thinking out loud) about one of his best-known songs – recently nominated for a Grammy. Love yourself is a great command … or invitation. After all, there are plenty of people who don’t love themselves – or don’t believe themselves to be lovable – and who sometimes then find it difficult to love others. Loving yourself can turn you into a narcissist who sees everyone and everything through a lens shaped only like yourself. (Apparently, even leaders of countries are not exempt from this.) This makes me the centre of the world – even other people’s worlds. It isn’t attractive, and it can produce dreadful selfishness. So, this is why Jesus gets the order right: loving God turns your attention away from needing to justify your own worthiness and focuses on something much more fundamental. I matter because I am made in the image of God. Therefore, I see myself through God’s eyes: infinitely valuable and eternally loved. So, what do I do with this? Well, it turns me outwards to love other people whose value is to be found in the same way. I am loved, therefore I love. So, Ed has got it right: love yourself, but only once you know you are loved. And then pass it on. So, happy birthday Ed Sheeran. Have a good one, and may it be filled with love. One of the questions constantly raised about the term “freedom of religion or belief” is that “belief” is assumed to be synonymous with “blind assumption”, “mere opinion” or “wishful thinking”. 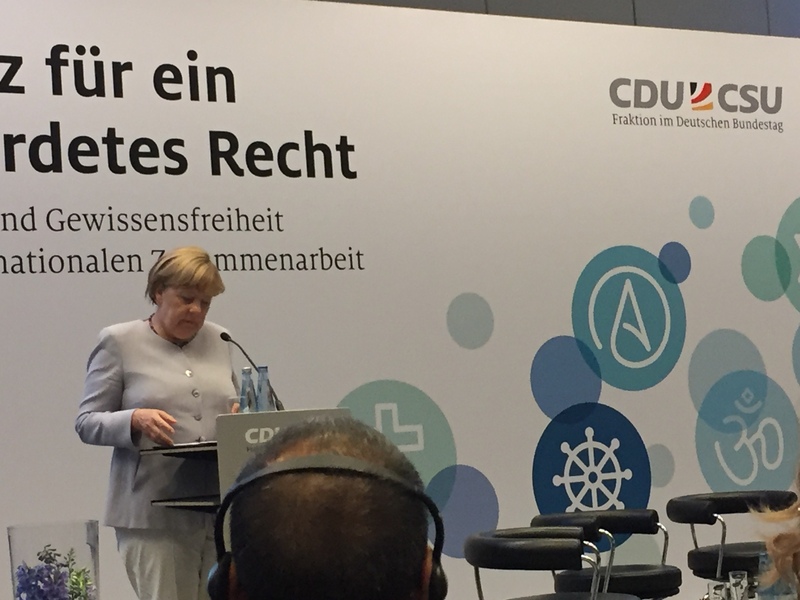 Having just finished with the IPPFORB in Berlin – read Angela Merkel's speech from yesterday in the Reichstag here but only in German – the matter is current. Right at the outset of his public ministry Jesus sets out his stall – against which he will be held accountable. So, what does he mean by these four phrases? The people have been longing and praying for the time when the Roman occupying forces will be expelled and the people (of God) will get their land, their worship and their freedom back. Jesus boldly states that the time has come – that the presence of God is now among them again. But, the evidence of their eyes tells them that he can't be – because the Romans are still there. And the holy God cannot be contaminated by being present among the blasphemous heathen. So, Jesus tells them to repent: not to grovel in humility at the recognition of their sinfulness, but, literally, to “change their mind” ('metanoia' in the Greek). Here repentance means changing the way they think about God, the world and us. So, the logic of the fourfold statement is this: change the way you (a) look at God, the world and us, in order to change the way you (b) see God, the world and us, in order to change the way you (c) think about God, the world and us, in order then to commit yourself to what you now see and think about differently. Here, “believe in the good news…” means to commit yourself – body, mind and spirit – to what you now see differently … in this case the possibility that God might dare to confound our expectations and expose himself to the world as it is, contaminating it with love and mercy and grace. I think this is a simple illustration of what is involved in believing. It isn't merely giving intellectual assent to a set of propositions about God and the world; rather, it means committing oneself to a world now seen differently. It is this element that our culture too easily ignores. It is now possible simultaneously to believe several mutually contradictory things about life and human meaning without being embarrassed, because we have lost the link between belief and commitment (with all its consequences for good or I'll) to the subject/object of that belief. And it is this inconvenient commitment that is causing too many people to be persecuted and oppressed in the twenty first century. You generally don't get crucified for hosting a weird private idea that makes no difference to the real world. “How long, O Lord, how long?” is the three thousand year old cry of a Hebrew poet – not an expression of misery from England football fans. It is a cry that burns in the heart and sometimes escapes the lips of those who look at the world and weep at yet another tragedy, another offence. The horror of Istanbul is just the latest in a litany of horrors. On the eve of the centenary of the slaughter at the Somme, we encounter again the sort of savagery that strips away the veneers of civilisation that we long for. Airports are terrible targets. These are places where different worlds intersect – where diverse humanity glances off each other in transit as we circle our tiny planet. They should be places of encounter, of surprise and reconciliation – departures crisscrossing arrivals. They are places where the world connects and we are exposed to the richness of humanity and culture. But, talking of stripping away the veneers of normality or civilisation, we are compelled to ask where the violence of hatred begins. The last week has seen a marked increase in racist incidents in our own country, with people being shockingly abused in public and cards being sent to Polish children telling them to get out. Maybe we are good at keeping such sentiments under the surface until they are given sanction by the erosion of the social inhibitors that normally keep them in check. But, just as racism begins not as a screaming campaign of violence, but as a seed that gets watered by silence and by rumour, so does its antidote. One of the stories Jesus told is pertinent here. The place where God is to be found is like a mustard seed – tiny, easy to tread on. Yet, where it takes root – hidden from sight – it has the potential to grow into a tree whose branches offer a place of refuge and habitation for the birds of the air. Of course, what is interesting about this image is that the branches don't get to be selective about which birds make their nests among them. This is a picture not just of hospitality, but of nurture. If racism and violence grow from small seeds that are allowed to take root in the minds and hearts of our children, then it is equally true that these will be challenged not by wishful silence, but by the planting, watering and nurturing of seeds that grow hope, commitment and love. It is not enough to dig up the bad seed; a good one has to be planted in its place. It was only very recently that I heard about the tradition at Ripon Cathedral of giving out apples at the end of the Christmas service. I bet the kids can't wait for Easter when they'll get chocolate instead. I'm now wondering what hidden traditions the other two cathedrals in this diocese have stored up for today. But, given all the traditions that accompany Christmas, at least Ripon still has the power to surprise. Apples on Christmas Day. Really. Yet, this is what Christmas is supposed to do to us: surprise us … with the presence of God – what John in our gospel reading calls “his glory” – where we least expect it. After all, the people we read about in the original nativity stories had been longing for this – to know that they had not been abandoned, and that God would be among them again. Decades of military occupation by the Roman imperial forces had driven deep the stain of humiliation – the Creator of the Universe apparently defeated by the pagan gods of power and caprice. Where was God to be found when all the evidence of experience and our eyes tells us that he is not here … where we are? Well, there is a theme running through the biblical story, and it isn't particularly comfortable. For people who think that God is only present where everything is sorted, every problem resolved, every indicator positive, Christmas becomes the epitome of embarrassment. For here, in the birth of the baby in Bethlehem, we are dared to look differently … and see God among us while everything in life remains a mess. The Romans are still here, still fleecing the people, still crucifying the protestors. Life is cheap. And pagan victory is rubbed in the faces of the poor, deluded people who keep hope alive in the face of 'reality'. But, the people among whom God comes in Jesus of Nazareth are invited to re-think reality – not to be optimists, just hoping everything will somehow get better for them, but hopers who see through the transience of today's powers to the haunting shadow of God's smile: I am for you – Emmanuel, I am with you. Not to make everything nice and tidy. Not to take you out of the world's mess. But, to come to you and stay with you – right where you are, whatever happens, however long history takes. And this is what goes to the heart of Christmas. God appears not to invade the present in a display of power and glory, but to be born as each of us has been born, and to slip into a tired, complicated, threatening and unsuspecting world at a particular time and in a particular place. No God of generalities or airy-fairy spirituality here – just one who gets stuck in, is down to earth, and who opts in to all that the real world is, and does not exempt himself from it. For those whose world has changed at Kellingley Colliery last week and the Redcar steel industry in recent months, this is particularly relevant where practical hope has to be encouraged and nurtured in the months and years ahead. Let's just pause for a moment and think about who it was who got invited to the first viewing of the scrap of humanity lying in the feeding trough in that obscure town in that obscure part of the ancient empire. Shepherds are workers, doing their stuff out on the hills, minding their own business, expecting nothing. Yet, they, the religious outsiders, are first to get a Christmas surprise. Later – probably several years later – it is pagan astrologers who come in from the cold in search of something they probably expected to find somewhere more interesting or significant. Again, outsiders to the religious establishment of the time. It's as if we are being surprised by a God who somehow climbs around the secure walls of our expectations and slips through our prejudices – especially the prejudices about God favouring either our pet religious projects or our self-condemning hesitations about our own worthiness. No, here we hear God whispering about a new way, meeting us where we are, but opening our eyes to a glimpse of living in a new world right in the heart of this world – opening our ears to the haunting echo of a different melody, a rhythm that invites a different dance. That's what was happening in Bethlehem that night. And that is what we are celebrating this morning. Not just the warm familiarity of a myth that makes us feel better, or the reminder of a fantasy that temporarily anaesthetises us from the horrors and uncertainties of our complicated lives. But, the invasion in the present – as it is – of a new and surprisingly realistic hope. In fact, the invitation of Christmas might be summed up as this: we need no longer be driven by fear, but can be drawn by hope. Why? Well, simply because the hope we will glimpse in Jesus as he grows from the baby of Bethlehem to the man of Calvary is one that is shaped not by some formula for self-improvement, nor some political or military project for sorting out the “wrong sorts of people”; rather, it is rooted in the person of God whose face we will see in Jesus and in whose person we will be dared to trust. Drawn by hope, not driven by fear. In this world, but not of it. Down to earth, but not bound by earth. Invited not to escape from the real world, but, trusting in the faithfulness of God, to plunge ourselves into the depths of the real world as it is now. So, today we should be tempted – not by apples, perhaps; that one didn't end so well, after all, did it? – to be surprised by the smile of God in the midst of experience. To see in this baby the seed of an inconceivable fruitfulness – that even in and through us, where we are , how we are, as we are, God might give birth to a tiny glimpse of that light that no darkness can extinguish.